I love to work in bright colours as my life is full of vibrant colour and energy.. but as part of our busy lives we also treasure our quiet moments, the complementary opposites of Yin and Yang that make up everyday life in Asia. 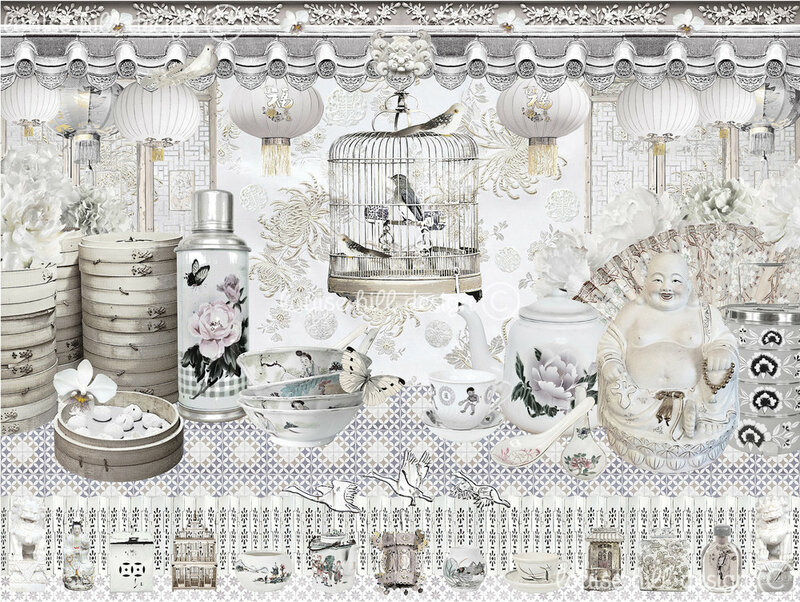 So for this design I wanted to create a peaceful composition, a calming delicate and gentle piece that still includes all of my much loved vintage imagery that comes from China, Hong Kong, Singapore and South east Asia. I spend many weeks taking photos outdoors, taking inspiration from daily life and the beautiful cultural places that I come across. I love to spend time collecting vintage fabrics, buttons, ribbons, tea flasks, tiffins, ceramics .. all of which fill my studio cupboards and shelves to the brim, each waiting for their turn to feature in one of my designs!